Palm Olein, Salt, Sugar, Chilli, Monosodium Glutamate, Garlic, Citric Acid, Lemon Leaf, Palm Fat, Lemon Grass, Onion, Maltodextrin, Lemon Juice, Contains Permitted Flavourings, Yeast Extract, Sodium Inosinate and Guanylate, Spices, Contains Permitted Colouring. All Food Additives Are Of Plant, Animal and Synthetic Origin. May contains traces of cereals containing gluten, egg, fish, crustaceans, mollusc, soy, milk, peanut and tree nuts. 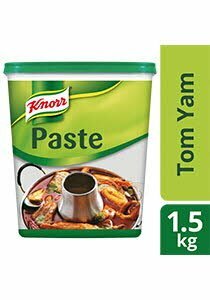 Dissolve 50g of Knorr Tom Yam Paste in one 1L of boiling water.